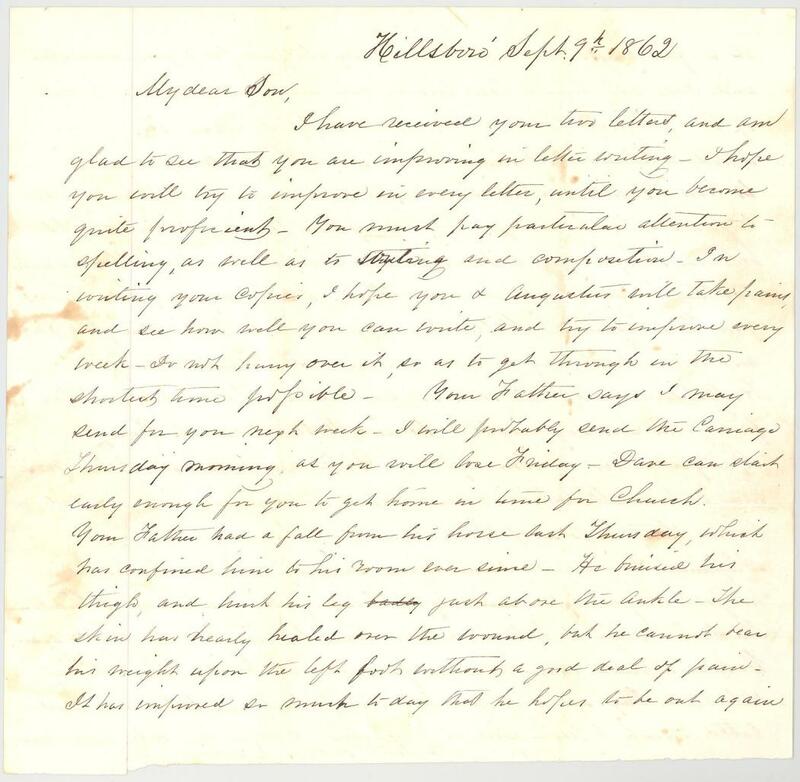 Item description: Letter, 9 September 1862, from Susannah Washington Graham (1816-1890) to one of her sons (believed to be George Washington Graham, who was born in 1847). 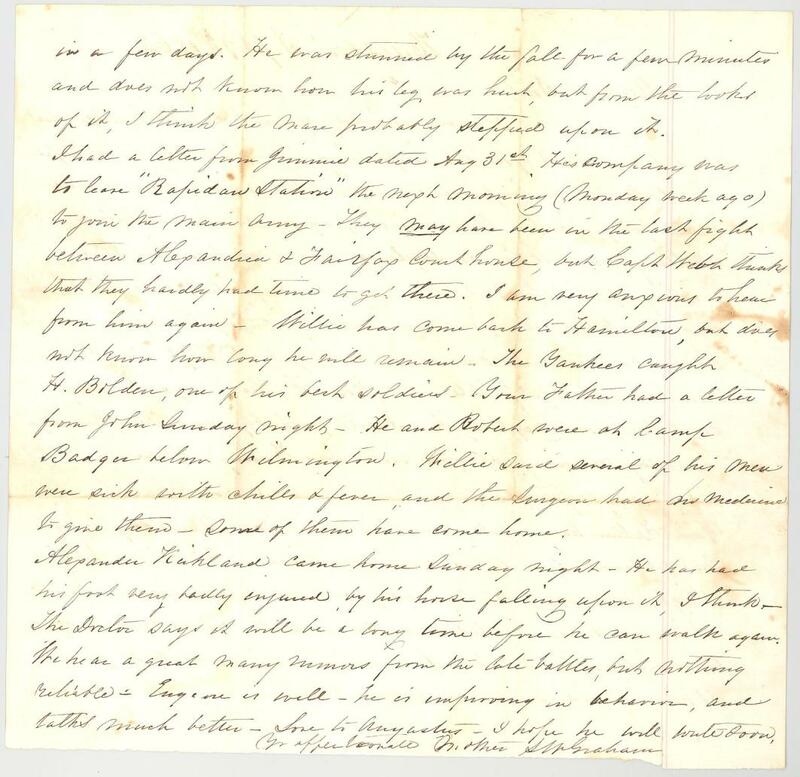 Mrs. Graham sends news about various members of the Graham family, including a report of her husband, William A. Graham, falling from a horse and several reports on the status of her five sons who are serving in the Confederate Army. Item citation: From folder 200 in the William A. Graham Papers, #285, Southern Historical Collection, Wilson Library, University of North Carolina at Chapel Hill. I have received your two letters and am glad to see that you are improving in letter writing. I hope you will try to improve in every letter, until you become quite proficient. You must pay particular attention to spelling, as well as to styling and composition. In writing your copies, I hope you & Augustus will take pains and see how well you can write, and try to improve every week. Do not hurry over it, so as to get through in the shortest time possible. Your Father says I may send for you next week. I will probably send the Carriage Thursday morning, as you will lose Friday. Dave can start early enough for you to get home in time for Church. Your Father had a fall from his horse last Thursday which has confined him to his room ever since. He bruised his thigh, and hurt his leg just above the ankle. The skin has nearly healed over the wound, but he cannot bear his weight upon the left foot without a good deal of pain. It has improved so much to day that he hopes to be out again in a few days. He was stunned by the fall for a few minutes and does not know how his leg was hurt, but from the looks of it, I think the mare probably stepped upon it. I had a letter from Jimmie dated Aug. 31st, his company was to leave “Rapidan Station” the next morning (Monday week ago) to join the main army. They may have been in the last fight between Alexandria & Fairfax Courthouse, but Capt. Webb thinks that they hardly had time to get there. I am very anxious to hear from him again. Willie has come back to Hamilton, but does not know how long he will remain. The Yankees caught H. Bolden, on of his best soldiers. Your Father had a letter from John Sunday night. He and Robert were at Camp Badger below Wilmington. Willie said several of his men were sick with chills & fever, and the surgeon had no medicine to give them. Some of them have come home. Alexander Kirkland came home Sunday night. He has had his foot very badly injured by his horse falling upon it, I think. The Doctor says it will be a long time before he can walk again. We hear a great many rumors from the late battles, but nothing reliable. Eugene is well, he is improving in behavior, and talks much better. Love to Augustus. I hope he will write soon. This entry was posted in Southern Historical Collection and tagged family, George Washington Graham, Graham family, Hillsborough, home front, injuries, North Carolina, Susannah Washington Graham, William A. Graham. Bookmark the permalink.